The epic conclusion to the Tournament of Destroyers is finally here! Goku and Hit face off on behalf of their respective universes. Their fight will determine which god of destruction will obtain the super dragon balls and call forth Super Shenron. Goku unleashes a devastating kamehameha while in Super Saiyan Blue with kaioken x10. Hit narrowly escapes the blast and reveals that his time skipping abilities have improved thanks to Goku’s onslaught. Goku requests that the limits to the competition be lifted so Hit can fight at full strength. While Beerus and Champa argue over the rule change, Goku steps out of bounds as his energy is quickly depleted while using kaioken x10. As Monaka enters the ring to face Hit, the assassin from universe 6 realizes how weak his opponent truly is and takes a fall in respect for Goku. Just as the tournament ends, Grand Zeno, the ruler of all universes, arrives and coveys his desire to witness a tournament of all 12 universes. Goku is ecstatic to fight even greater opponents and very informally addresses Grand Zeno to the horror of everyone else. Universe 7 wins the tournament and Beerus wishes for Earth of universe 6 to be restored. Goten and Trunks accidentally lock themselves inside Monaka’s delivery truck and hitch a ride to planet Potaufeu. They engage with a group of goons that hope to unlock the power of the Super Human Water. Once this legendary “water” is unearthed, the creature within the Super Human Water container covers the intergalactic goons and forms gelatinous copies of them. We learn that this creature is known as Commeson. It was a creation of the people of Potaufeu that went rogue and developed fiendish desires. Once enveloped and copied by Commeson, the original beings begin to fade into nothingness. Vegeta shows up and is copied by Commeson. Goten and Trunks fuse into Gotenks to combat the evil Vegeta duplicate, but are easily defeated. Goku arrives and with some surprising help from Monaka is able to defeat Commeson and save Vegeta. The future is in peril once again due to a new foe simply known as Goku Black. Future Trunks and Mai help lead a resistance against this monster, but have been defeated at every turn. 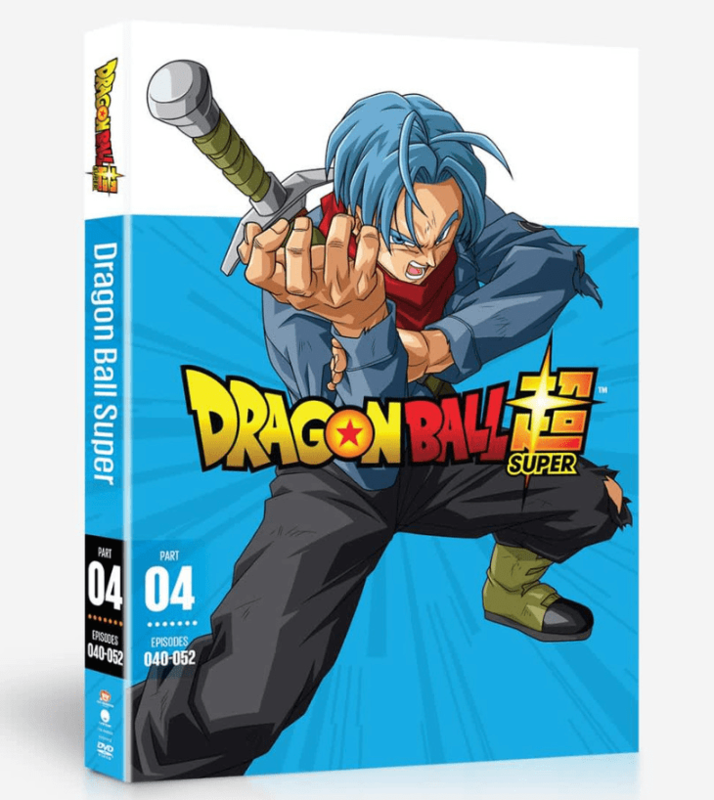 With no other option, Trunks returns to the past to recruit the help of the Goku and Vegeta. Trunks returns to the past, but Goku Black is able to follow him with the use of a time ring. Beerus and Whis explain that only Supreme Kai’s possess time rings. Goku and Goku Black face off, but the battle is quickly halted when Black is sucked back into a portal and returns to his own time. Before vanishing, Black is able to destroy Trunks’ time machine. Bulma reveals that she still has the old time machine and begins to repair it so our heroes can return to Trunks’ timeline and defeat Goku Black. Beerus and Whis vaguely recognize Goku Black’s energy and speed off to universe 10 accompanied by Goku. The episodes in Dragon Ball Super: Part 4 are honestly a mixed bag of good and bad. There is a lot to love about these episodes, but some of the filler is very hard to watch. The action throughout this arc is phenomenal. There are some exciting bouts including Goku vs Hit, Gotenks and Goku vs Commeson Vegeta, Trunks and Goku vs Goku Black and many more. The quality and consistency of the animation style really hits a high point. One of my major complaints of Dragon Ball Super in general has been the inconsistent animation style. Not as single episode in this box set ever suffered from that issue. The music is exhilarating and the call backs to previous arcs is pure nostalgia. The comedy is a little hit and miss, but I truly enjoyed the acknowledgement of how ridiculous the Super Saiyan God Super Saiyan name actually is. The voice acting is on point as always and I LOVE that they got Brian Drummond to voice the Commeson Vegeta. If you don’t know what I’m talking about, look it up. You’ll enjoy it, trust me. As previously mentioned, the filler episodes are rough. The episode about Pan flying around in space was just awful. The most dissappointing plot point in the Dragon Ball franchise gets put on blast in these episodes. Gohan becoming a scholar instead of continuing to train kills me. Nearly half of an episode focuses on Future Trunks reminiscing about how powerful Gohan used to be and how he is a shell of his former self. The other half of that episode is essentially a recap of the History of Trunk episode which is amazing. I’d take one armed Future Gohan over scholar Gohan any day. Oh what could have been… Overall, these episodes set up some amazing events, but feel more like a stepping stone than a self contained arc. Thanks to Funimation for providing us a review copy in exchange for an honest review!